We manufacture Ultrasonic Cleaners that are fast to operate and are highly consistent when it comes to performance. When compared to other cleaning products involving ultrasonic cleaning process, the ultrasonic cleaners we manufacture are much safer. With these products, we ensure high durability and potential functional capacity. Table Top Models: Table tops are provided with optional heaters and resettable mechanical/ electronic timers. They are all powered by SMPS based Mosfet/ IGBT device electronic generators. All Our UCT models can be used not only for Industrial cleaning but also for medical cleaning, homogenizing, Sonochemistry, degassing & cell destruction in laboratory process . 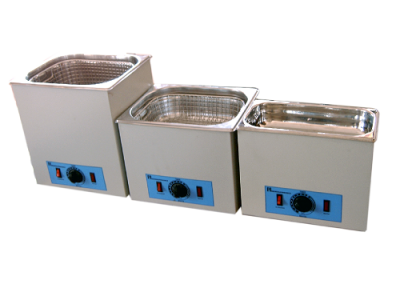 We offer ultrasonic cleaner baskets that are of high quality. These are manufactured to mainly clean tools in large batches. They operate with low noise and have conveniently designed applications to be paused in the middle of the operation. These cleaner baskets satisfy the cleaning requirements of our clients across several segments. We offer high capacity cleaner baskets with digital display in varied sizes. Microsupersonics offers a wide range of Industrial ultrasonic cleaning systems. Powerful ultrasonic oscillations produced by a solid state generators/ SMPS based generators are converted into mechanical vibrations by PZT transducers. These vibrations produces intense scrubbing action through out the liquid media which in-turn pulls out the contaminants from hidden recess & craves of complicated assemblies. Ultrasonic also accelerating chemical action of cleaning media (water and solvents) MSS comprehension of standard & custom built cleaning systems which meet all your cleaning & degreasing applications needs. Our standard equipments come with SS wire mesh basket, mechanical timer & thermostatically controlled heaters. We manufacture Multistage Cleaning or Multistage vapor degreasing systems with multiple chambers. Our company is specialized in manufacturing ultrasonic as well as vapor degreasing systems for use in accurate cleaning of water-sensitive components. The solvent cleaning enables enhanced process performance and recovers solvents, in addition to saving labor, costs and energy. These are high end cleaning systems that operate in three different stages including precleaning, ultrasonic and vapor degreasing or drying system. Best suited for descaling, derusting, decarbonizing and degreasing, this system is also useful for many other cleaning requirements across the textile, electrical, electronics and automobile engineering sectors. The main features of this system include constant automatic distillation, automatic/semi-automatic material transfer system, water separation, recirculation and filtration. We also provide these systems with optional facilities such as fume extractions and chilling plant facilities and also customize them as per the requirements of our clients. Customised desigen MHS(Material handaling system) with PLC control. Microsupersonics are innovative ultrasonic and vapour degreasing systems for precision cleaning of water sensitive components. solvent cleaning provides improved process performance save energy, cost, labour and recovers solvents. These Cleaning systems normally have 3 stages - precleaning, ultrasonic and vapor degreasing,drying system. The system is ideal for degreasing, derusting, descaling, decarbonising and other cleaning requirements of automobile engineering, electrical and electronics and textile industries. Continuous filtration, recirculation, automatic distillation, water separation, and automatic / semi-automatic material transfer system are the features of the system. Fume extractions and chilling plant facilities are optional. Custom built cleaning system are also available.